What is new with the Gen 2?? We listened to your suggestions and did our best to improve upon an already good thing. 1) We have done away with the index plungers for a more conventional type of latch closure. The new latches are high quality, fully adjustable toggle latches that are rated at 220 pounds holding capacity each. They are easy to install and very easy to adjust to assure that your rack/table will never rattle. 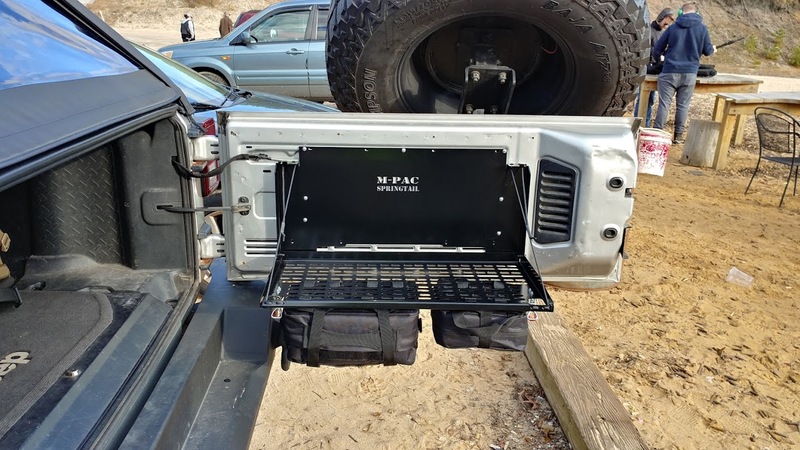 2) Anyone who has attempted to hard mount a rack to the tailgate of the JK probably found out quickly that there are a number of angled interior supports that when approached wrong will snap a drill bit (making a 30 minute job into a multi-hour frustration). We have mapped the interior supports of the door and for those interested in hard mounting their Springtail rack….now there are carefully placed holes already predrilled in the rack to make that job super easy! High quality laser cut MPAC grid with precision fitted components (patent# US D678,167S). 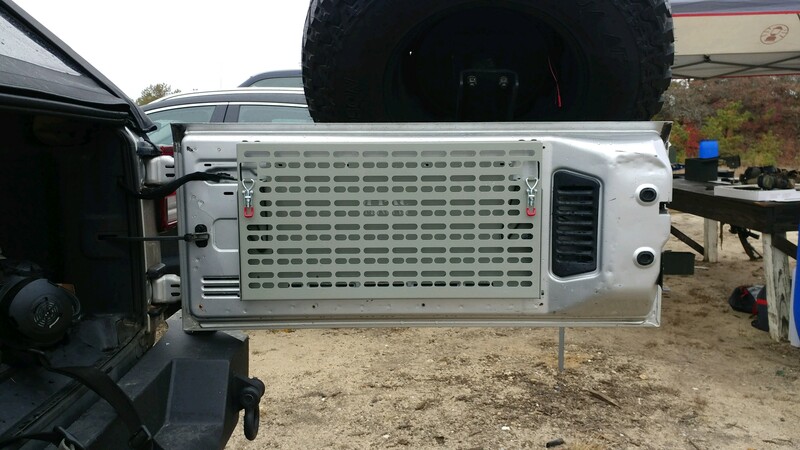 The rack is rated for about 40 pounds but there is always the option of drilling holes if you want to mount screws to the tailgate to take a heavier load. Paracord suspension and pull fobs can provide needed cordage in an emergency. Inexpensive to replace or to customize. 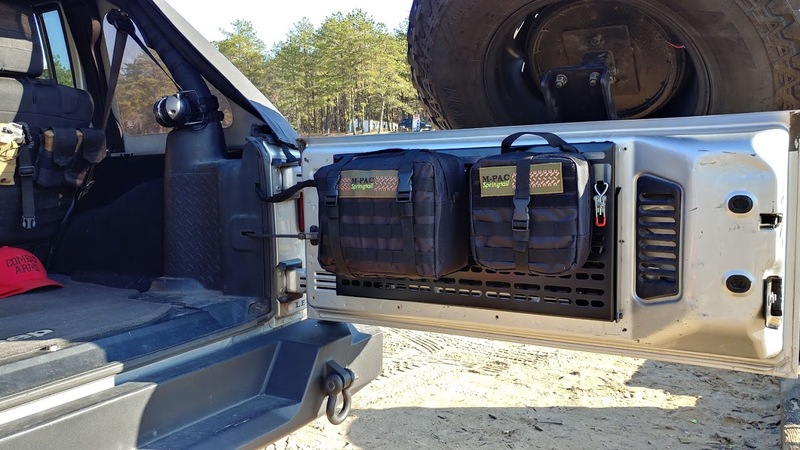 Completely reversible with no modifications to your Jeep! When we say heavy duty, we mean HEAVY DUTY! 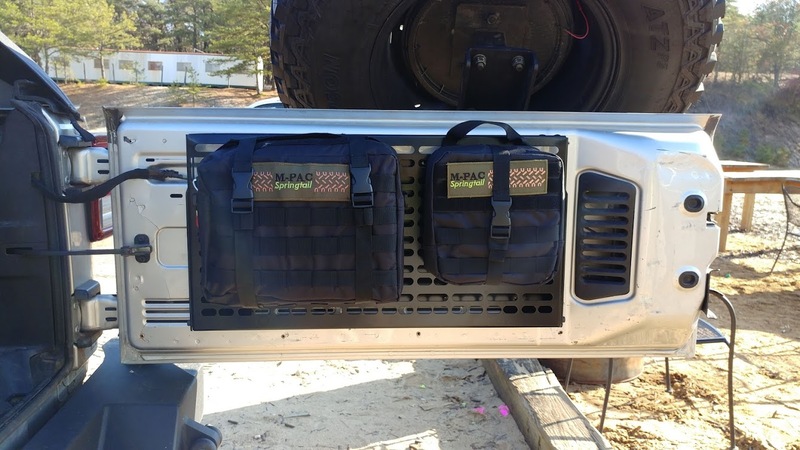 The JK Unlimited MPAC Rear Door Rack is composed of formed and laser cut 16 gauge steel and the backing plate is manufactured from 12 gauge steel. We have included the best quality hardware that we could find. Likely it will outlast your vehicle. After the initial assembly of the rack……installation takes less than 3 minutes and requires only basic hand tools. The instructions are clear with illustrations. All you have to do is pop in the special nylon inserts and screw the rack to the panel…really, it could not be any easier…we have thought of everything! Yes, you may have a few nuts and bolts left over. Since some of the parts are small, we instruct our hardware suppliers to add some extra pieces, just in case. In particular, the M4 nuts and bolts. The blind inserts can only be used a couple of times before stripping out, this is the price of not having to alter/drill your Jeep. If you need new inserts, they can be purchased on the website. Be forewarned though, currently they are expensive to produce and thus we are forced to pass that expense onto the consumer. As we make larger numbers of them…the price will decrease. Currently they are about $16.00 for eight (includes shipping). We designed this system to have as many easily replaceable parts as possible. 550 Para-cord is widely available at Amazon, Walmart (in the camping section), sporting good stores and military surplus stores. It is available in many colors and can be easily switched out to personalize your application. Shrink-Wrap Former customers may ask why we use shrink-wrap instead of the previous plastic tensioners. As you know, we spend a great deal of time making sure that our products do not make any noise or rattles. We found that the plastic tensioners we capable of making an irritating vibration noise in certain circumstances….the shrink-wrap eliminates that potential. You may notice that there are a series of small round holes in the back plate that do not match up to any factory holes. 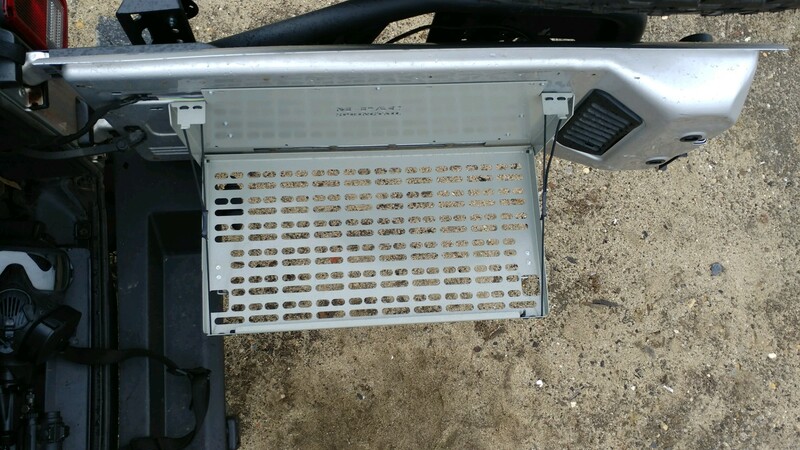 Anyone who has attempted to hard mount a rack to the tailgate of the JK probably found out quickly that there are a number of angled interior supports that when approached wrong will snap a drill bit (making a 30 minute job into a multi-hour frustration). Springtail has mapped the interior supports of the door and for those interested in hard mounting their Springtail rack….now there are carefully placed holes already predrilled in the rack to make that job super easy! 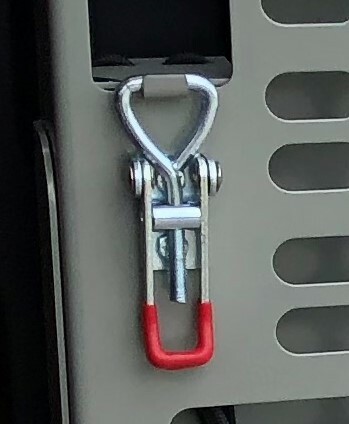 Mandatory Disclaimer: While these predrilled holes will work for the majority of JK tailgates, there is always the possibility that some interior supports may not match up for many possible reasons (IE: “Out of Spec”, variances between suppliers, etc….). Drill at your own risk. Springtail takes no responsibility in any damage that you may cause to your jeep or yourself when you attempt to modify your vehicle. Always wear the proper safety equipment and drill pilot holes and probe to make sure that there are no obstructing materials. 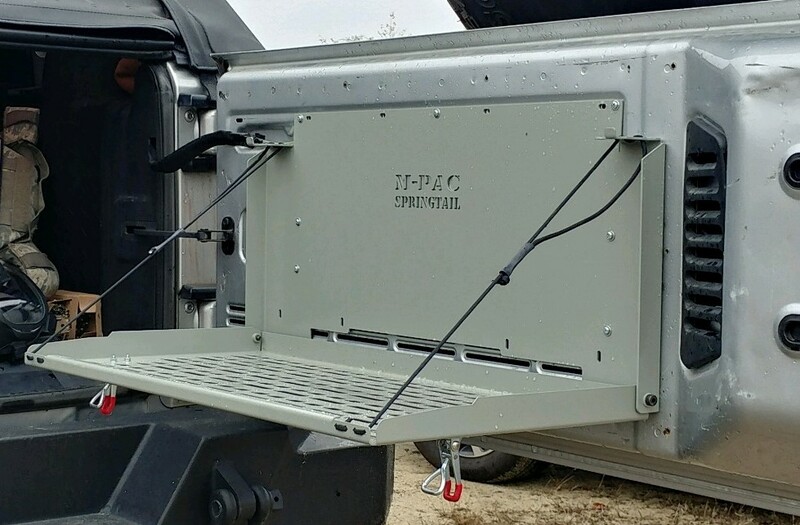 Also, Springtail will not comment or suggest what materials (types of screw/riv-nuts should be used for mounting, nor what specific load capacities your tailgate can handle. The rack was tested to 40 pounds in the closed and open positions. That said, we recommend that it be used for lighter cargo and that any heavier items be properly secured on the cargo floor. This is a well built ,also was very easy to install it looks great adds extra storage. I cant say enough about this product.